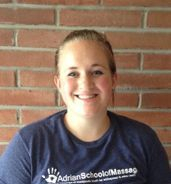 Christy Gagneur, LMT is the founder and director of Adrian School of Massage. She uses her compassion for others, knowledge of massage, and experience in entrepreneurial business to offer her best to the ASM community. Christy lives in Clinton, Michigan with her husband and their two daughters. Christy is a graduate of the Ann Arbor Institute of Massage Therapy and has been practicing in the Lenawee area since 2009. She is certified in Myofascial Release, Neuromuscular Therapy, and Infant Massage Therapy/Instruction. She specializes in massage as it relates to women's health – including Prenatal Massage and Fertility Massage. She has also received training in Oncology Massage, Sports Massage, Reflexology, and various other modalities. Click HERE to Schedule With Christy!